Rotator cuff injury can cause severe pain. You can try home remedies to reduce pain and inflammation. See your doctor when necessary. 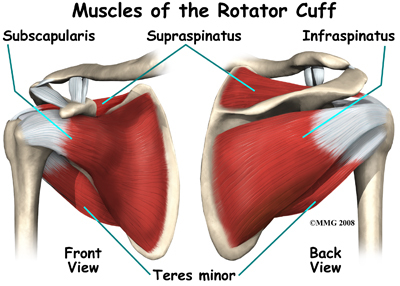 The rotator cuff is basically a group of tendons and muscles that work together to stabilize your shoulder joint. It consists of muscles (infraspinatus, teres minor, subscapularis, and supraspinatus) that connect your shoulder blade to the upper arm. These tendons provide stability, and the muscles let you rotate your shoulder with ease. You may experience shoulder pain for different reasons; however, a rotator cuff injury is usually the most common cause of concern. Rotator cuff injuries usually lead to three common conditions, including rotator cuff impingement syndrome, rotator cuff tendonitis, and a rotator cuff tear. Depending on your condition and symptoms, your healthcare provider may treat you with anti-inflammatory drugs, painkillers, steroid injections, and physiotherapy. Surgery is another option to consider. X-Rays: The test usually helps identify bone spurs or broken bone after an injury to your shoulder. A rotator cuff tear doesn't appear on any X-ray though. Ultrasound: The test involves using sound waves to produce images of smaller structures in your body, including soft tissues such as tendons and muscles. Magnetic Resonance Imaging (MRI): The test involves using radio waves and a powerful magnet to produce more accurate and detailed image of bones and soft tissues. You don't usually have to do much to fix a minor injury. If the pain is not severe, you can always try certain home remedies to trigger healing. If it is a repetitive injury, take a break from what caused the pain in the first place. Limit overhead activity and heavy lifting until your pain subsides. Using an ice pack will help reduce pain and inflammation. You should put ice on your shoulder for 20 minutes or so and repeat it every 3-4 hours. Once the inflammation reduces, you can use hot packs to relax sore muscles. Consider taking OTC pain relievers such as naproxen, ibuprofen, or acetaminophen to deal with pain. In addition to these, you should also consider performing range-of-motion exercises to improve the functionality of your shoulder. Working with a physiotherapist is a good idea because they will help you understand how to stretch and strengthen the muscles around your shoulder using proper exercise moves.You can always start with some of the following exercises, but consult your doctor if the pain persists or aggravates. Exercise 1: Lie on your stomach on a bed and put your right arm out at your shoulder level while bending your elbow to 90 degrees. Now, raise your right hand slowly while keeping your elbow bent. Stop when your hand comes to the shoulder level. Return to the starting point and repeat with the left arm. Exercise 2: Place a rolled-up towel under your left armpit and lie on your right side. Stretch your left arm right above your head while keeping your right arm at your side. Make sure the elbow is at 90 degrees and your forearm is against your chest. Now, slowly roll your left shoulder out and raise your left forearm until you reach the shoulder level. Lower it slowly and repeat with your other arm. Exercise 3: Lie on your left side while resting your right arm on the upper side of your body. Bend your elbow while keeping the left forearm resting on the ground and roll your left shoulder in. Now, raise your left forearm slowly until it reaches your chest. Return to the starting position and repeat the same with the other arm. Exercise 4: Start from a standing position and take your left arm at least halfway between the front and side of your body. Keep your thumb down and raise your left arm until it forms a 45 degrees angle. Don't lift further if it hurts. Lower your arm slowly and repeat the same with your right arm. You can try several other exercises as well. You can opt for an exercise that stretches your shoulder, such as anterior shoulder stretch, posterior stretching, wall stretches, or pendulum exercise. You can also do exercises to strengthen your shoulder, such as internal or external rotation exercise with band, wall push-ups, isometric shoulder exercises, and shoulder blade retraction with or without tubing. The following video will help you learn more about some exercises to fix your rotator cuff. For minor rotator cuff injuries, it is usually enough to take rest and use ice and physical therapy to relieve the symptoms. You may need a combination of medication and therapy to deal with a severe injury. You may have to take a steroid injection if conservative treatments don't seem to work in your case. A steroid injection is usually the option when the pain starts interfering with your daily activities, sleep, or exercise. You will have to take an injection into your shoulder joint, and it helps with the pain, but it may weaken the tendon if not used judiciously. There are different situations when you'll have no choice but to go for rotator cuff surgical procedures. Bone Spur: Your pain can be due to an overgrowth of bone that irritates your shoulder cuff. You will have to undergo a surgical procedure to remove the excess bone and fix the damaged tendon. Tendon Replacement and Repair: A surgical procedure is necessary to fix a torn rotator cuff tendon, but if it is seriously damaged and cannot be attached back to the arm bone, your surgeon may consider replacing it with a nearby tendon. Shoulder Replacement: Severe rotator cuff injuries may call for serious measures, and you may even have to go for a shoulder replacement surgery. The reverse shoulder arthroplasty is a common choice to improve the stability of the artificial joint.